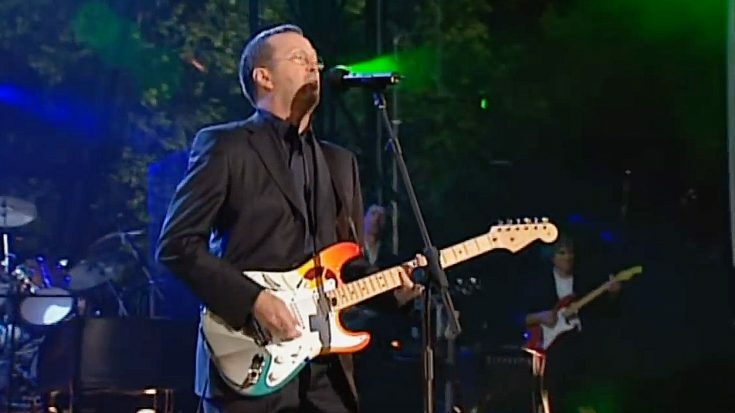 In 2002, Eric Clapton Put On A Masterclass With His Refined Take On “Layla”! Eric Clapton Does It Best! It shouldn’t really surprising to hear when I tell you that Eric Clapton is truly one of the all time greatest guitarists of all time. He is widely regarded as one of the most iconic and influential musicians of his time, of all time, really. His style, musicianship, and overall talent are the stuff of legend. He is often imitated, yet never duplicated. He is one of the best, pure and simple. In 2002, he was invited to play at The Queen’s Jubilee. As you could imagine, the performance was stellar, as you’d expect from Eric Clapton. The crowd was truly mesmerized by Eric’s playing and singing are the stuff of legend and the crowd got to see all of that, especially in this song that he played! What you’re about to watch is a video in which the aforementioned Eric Clapton takes to the stage to perform his iconic hit Layla. To put it simply, Eric Clapton puts on a masterclass and steals the show. Don’t believe me? See for yourself!